Being retired not only gives me more time to become irritated over fairly mundane things (see Grumpy Old Man), but it also provides me the time and opportunity to do something about them. 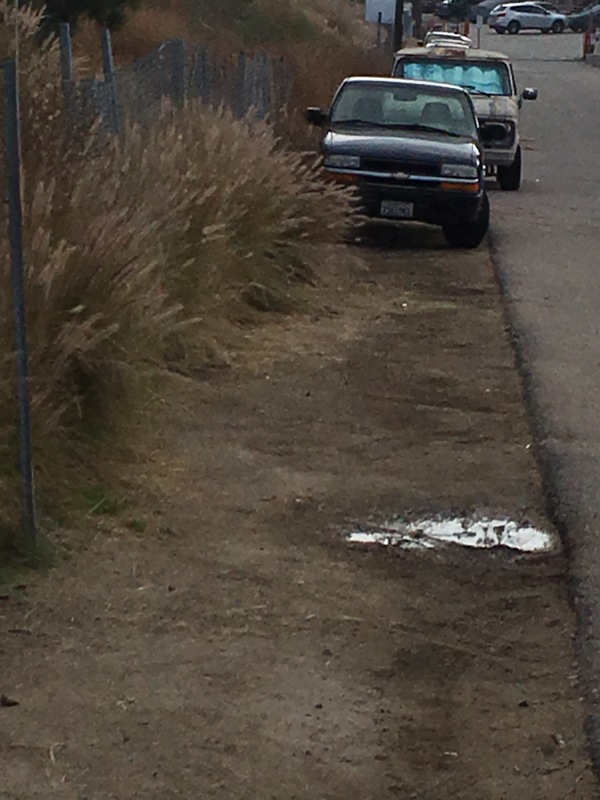 So, day after day, when I saw a small, dilapidated RV parked along the frontage road that leads to the road that leads to my house, I became convinced that this eyesore was either abandoned or that even worse, someone was using it as a residence. I contacted the local sheriffs who told me to contact the Highway Patrol whose non-emergency number is always busy. Somehow, though, when I wasn’t paying attention, the eyesore disappeared. 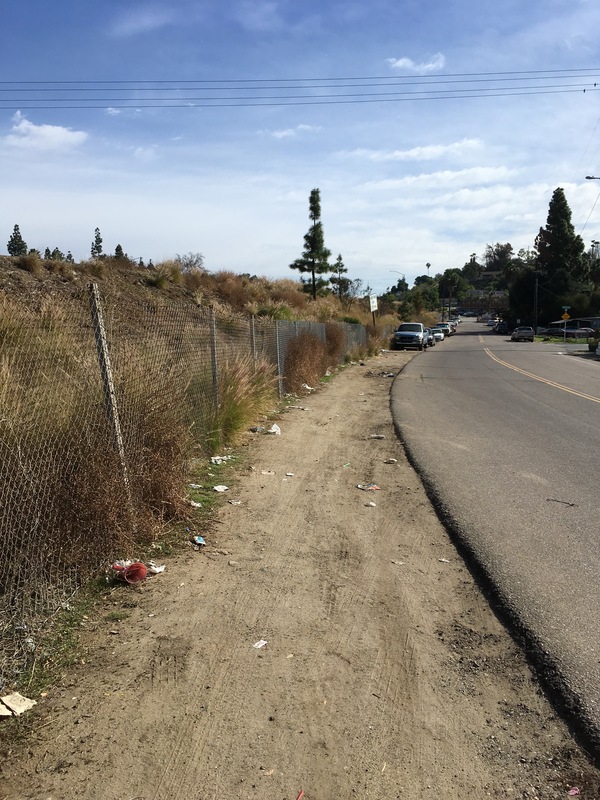 However, the owners left behind a pile of refuse, and as I looked up and down the frontage road, I realized just how trashy the 150 yards or so that I drive past several times a day had become. 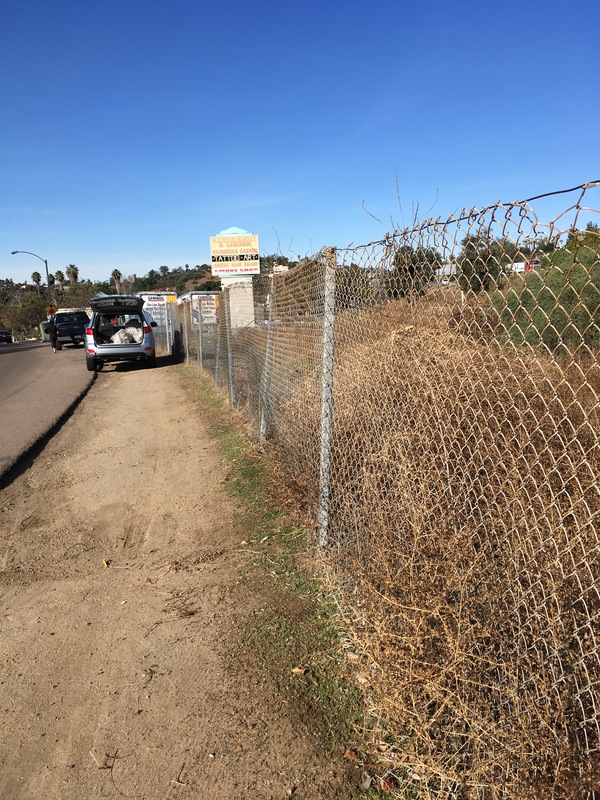 The dirt pathway along a fence that parallels a freeway entrance is a walkway for many middle school kids who frequent the local Starbucks and the convenience store on the corner and leads to two or three apartment buildings down the way. Initially, I thought I was just going to clean up after the RV dwellers so I grabbed a couple of trash bags, a rake, a pair of gloves and went down to survey the damage. What I found was that they had jettisoned two wooden valances and an enormous pile of trimmed cactus. I’m not kidding. Huge chunks of cacti, all cut and cleaned, were dumped in a muddy pile. I loaded the mess into the back of my SUV and carted it home to my trash bins. But that wasn’t enough for me. 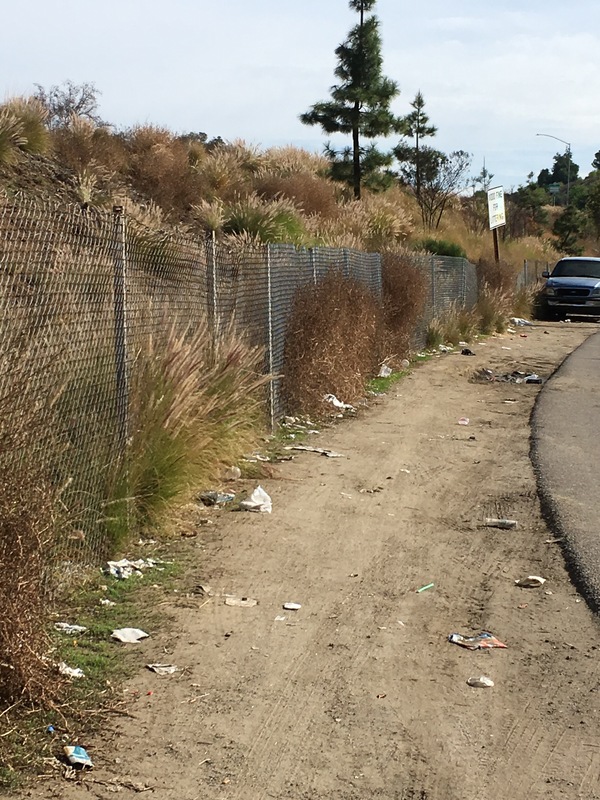 Spending some time down by the fence made me notice just how awful all of that trash looked and how badly it needed to be cleaned up. I became a man on a mission. I bought a fresh box of trash bags, spread some plastic down in the back of my vehicle and decided to go to work on the problem. It felt fun to have a project like this. Smelly, but fun. I spent about an hour a day for four days to get the area cleaned to my satisfaction. The typical haul on each day was 2-3 bags of weeds and trash. The variety of trash was impressive. I found the kinds of things you’d expect–lots of drink containers, fast food packaging, cigarette butts, and plastic crap of all kinds. In addition there was clothing, a pillow, many small liquor bottles, and one used condom. 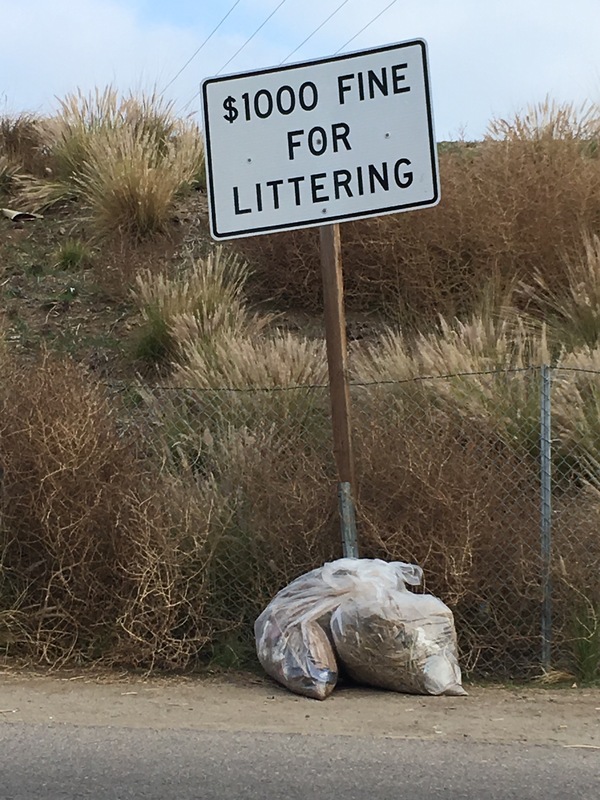 My neighbors are clearly not intimidated by the single sign that threatens them with a $1000 fine for littering. All in all, I ended up with about 10 bags of trash. As menial as it was, the work was incredibly satisfying. Every day as I drive by, I survey the work I have accomplished and take note of any new litter that has begun to accumulate. I suspect I will become like the guy who purportedly used to spend his days painting the Golden Gate Bridge from one end to the other and back year after year. And while this may be a Sisyphean task, it feels good to see the neighborhood look a little cleaner. Today, as I was finishing up, two different strangers stopped to introduce themselves and thank me for the work that I was doing. It was not important to me to get the recognition, but it did let me know that others had seen the problem and appreciated that someone took some action. While it will take some continued effort to keep it clean, I now feel a sense of ownership. I’ve started to keep my eye out for other areas nearby that are showing signs of neglect that may need a little love and attention. If I keep this up, I may need to get a cape and a secret identity–maybe take to cleaning up only under the cover of darkness.